Naipes Inca was one of Della Penna's leading brands of Spanish-suited playing cards, and was produced in successive editions until the company was taken over in 1978. The edition on this page shows the company name as C. Della Penna & Cía, along with an early version of the company logo in black & white only. In later editions it is coloured. 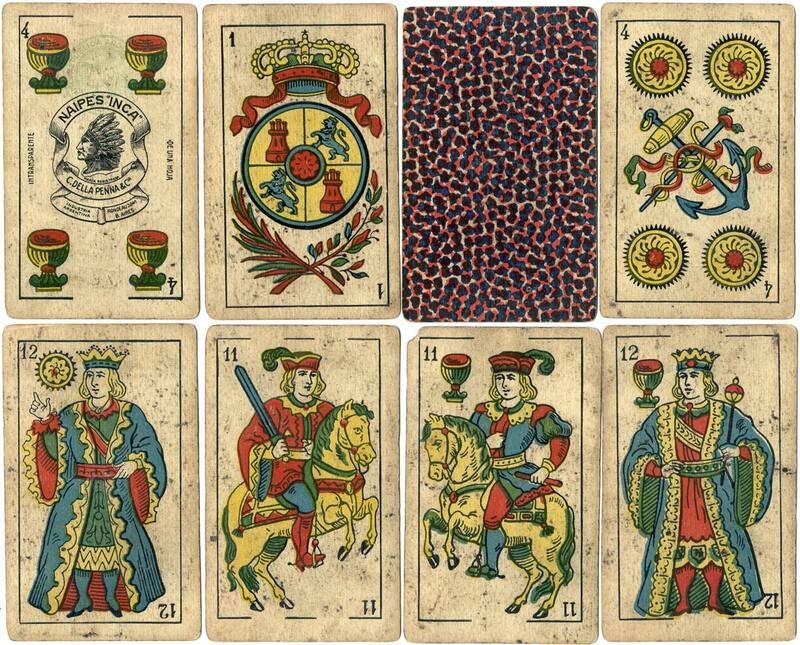 The court cards and most of the numeral cards are based on the Spanish Catalan designs which had been used earlier by Francisco Girbau and were also copied by Cappellano, Fourvel and Justo Rodero. As a result of their widespread acceptance they have become known as "The South American Spanish Pattern". Above: cards from an early edition of Naipes Inca, manufactured by C. Della Penna & Cía in c.1935. The ace of coins is of Cádiz style, but the courts are Catalan style. Although the ace of coins would be re-designed in subsequent editions, these Catalan-style court designs were used throughout the duration of the company's playing card production, albeit with some variations in colouring or simplifications in the details. They were also adopted by several other manufacturers. An anonymous miniature version was also printed showing the same ace of coins design, which may have been printed by Della Penna for a third party. Left: this version of the "Mercury" tax stamp from the four of cups suggests a date somewhere between 1922 to 1940s, but without any further clues from wrappers or regarding the company's history we cannot narrow this down any more.